This is my most favorite and sentimental piece of jewelry. This ring was given to me by Becky when I was her "Man of Honor" in her wedding. The story behind the inscription is that while in college we took a German class together and I always used to say "Es ist Rein?" thinking it meant "Is this rain?". Well, come to find out it means "It is pure." 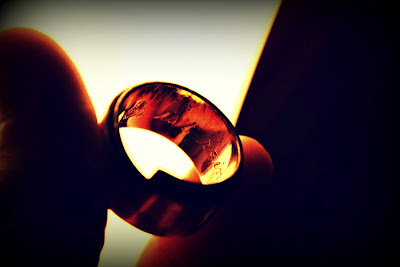 and this ring symbolizes our pure never ending friendship.